A night of soothing jazz music awaits you in Heydar Aliyev Palace on April 21. 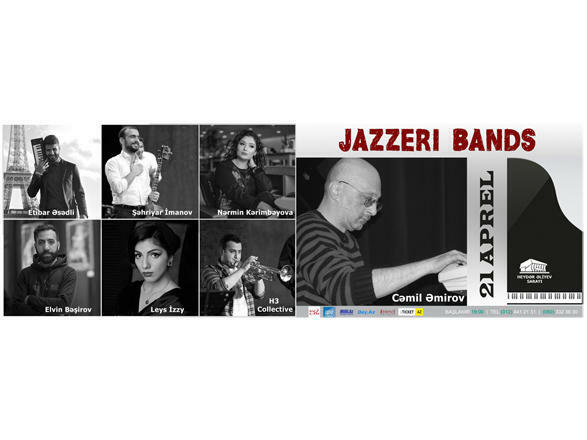 A wonderful show will bring together musicians Baku's leading jazzmen. The concert will feature well-known jazzman, composer, honored art worker Jamil Amirov, laureate of international competitions, singer Shakhriyar Imanov, vocalists and musicians Narmin Karimbayova, Elvin Bashirov, Leys İzzy and H3 Collective, Trend Life reported. Talented singer, composer and pianist, student of Musical Didier music school in Paris Etibar Asadli, will be a special guest at the event. The winner of various international competitions successfully performs in Europe, promoting Azerbaijan's music abroad. Ticket prize is 10-50 manats. Tickets can be purchased at all ticket offices of the city, ASAN Service Centers, Gənclik Mall and 28 Mall. You can also buy tickets at website www.İticket.az.